Two American aid workers seriously ill with Ebola will be brought from West Africa to Atlanta for treatment in one of the most tightly sealed isolation units in the country, officials said Friday. One is expected to arrive Saturday, and the other a few days later, according to Atlanta's Emory University Hospital, where they will be treated. They are due to arrive in a private jet outfitted with a special, portable tent designed for transporting patients with highly infectious diseases. It will be the first time anyone infected with the disease is brought into the country. U.S. officials are confident the patients can be treated without putting the public in any danger. Canada's health minister reminded residents Friday that risk in Canada remains low. “There are no confirmed cases of Ebola in Canada," said Federal Health Minister Rona Ambrose. "The Ebola virus itself does not spread easily from person to person. It is not like the flu. All points of entry into Canada are routinely monitored and travellers showing symptoms would be referred to quarantine officers, who have the authority to implement public health measures under the Quarantine Act to protect Canadians." Ebola is spread through direct contact with blood or other bodily fluids from an infected person, not through the air. The two Americans — Dr. Kent Brantly and Nancy Writebol — worked for U.S. missionary groups in Liberia at a hospital that treated Ebola patients. The State Department and the Centers for Disease Control and Prevention are assisting the groups in their transfer. The government is working to ensure that any Ebola-related evacuations "are carried out safely, thereby protecting the patient and the American public," U.S. State Department spokeswoman Marie Harf said in a statement released Friday. A U.S. Department of Defence spokesman said Dobbins Air Reserve Base in Marietta, Georgia, will be used for the transfer. The aircraft is a Gulfstream jet fitted with what essentially is a specialized, collapsible clear tent designed to house a single patient and stop any infectious germs from escaping. It was built to transfer CDC employees exposed to contagious diseases for treatment. The CDC said the private jet can only accommodate one patient at a time. Brantly and Writebol are in serious condition and were still in Liberia on Friday, according to the North Carolina-based charity Samaritan's Purse, which is paying for their transfer and medical care. An Emory emergency medical team in Liberia has evaluated the two aid workers, and deemed both stable enough for the trip to Atlanta, said Emory's Dr. Bruce Ribner. Hospital spokesman Vincent Dollard said the first patient was scheduled to arrive Saturday. Brantly, 33, works for Samaritan's Purse while Writebol works for another U.S. mission group called SIM. Late last week, Samaritan's Purse officials said Brantly had tested positive for the virus. Shortly after that announcement, Writebol's infection was disclosed. Liberia is one of the three West African countries involved in the Ebola outbreak, the largest since the virus was first identified in 1976. The two-bed Emory isolation unit opened 12 years ago. It was designed to handle workers from the CDC if they became infected while working on a dangerous, infectious germ. It is one of about four such units around the country for testing and treating people who may have been exposed to very dangerous viruses, said Dr. Eileen Farnon, a Temple University doctor who formerly worked at the Atlanta-based CDC and led teams investigating past Ebola outbreaks in Africa. There is no specific treatment for disease, although Writebol has received an experimental treatment, according to the mission groups. "If there's any modern therapy that can be done," such as better monitoring of fluids, electrolytes and vital signs, workers will be able to do it better in this safe environment, said Dr. Philip Brachman, an Emory University public health specialist who for many years headed the CDC's disease detectives program. "That's all we can do for such a patient. We can make them feel comfortable" and let the body try to beat back the virus, he said. He was echoed by Emory's Ribner, one of the doctors who will be seeing the Ebola patients. He stressed that safety precautions will be taken by staff in the unit. "I have no concerns about even my personal health or the health of the other health care workers who will be working in that area," Ribner said. The unit has its own laboratory equipment so samples don't have to be sent to the main hospital lab. Located on the ground floor, it's carefully separated from other patient areas, Farnon said. Health experts say a specialized isolation unit is not even necessary for treating an Ebola patient. The virus does not spread through the air, so standard, rigorous infection control measures should work. The current outbreak in Liberia, Guinea and Sierra Leone has sickened more than 1,300 people and killed more than 700 this year. Also on Friday, the head of the World Health Organization said the Ebola outbreak in West Africa is out of control but can be stopped. 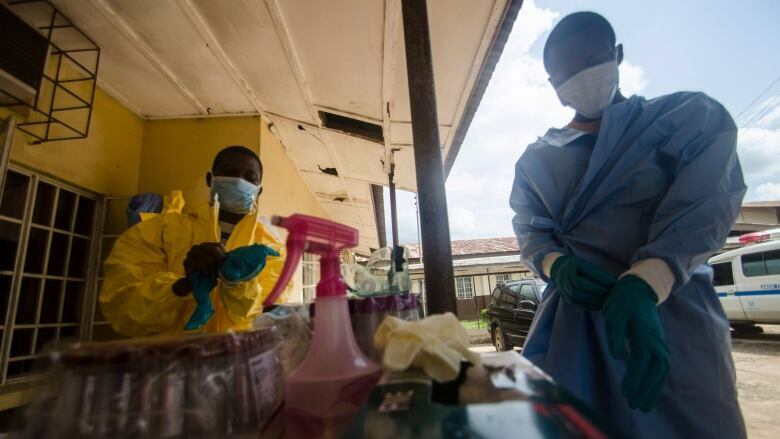 "This outbreak is moving faster than our efforts to control it," Margaret Chan told the presidents of Guinea, Liberia and Sierra Leone at a meeting in Guinea's capital Conakry. "If the situation continues to deteriorate, the consequences can be catastrophic in terms of lost lives but also severe socioeconomic disruption and a high risk of spread to other countries," she said, according to a WHO transcript. Experience showed that the outbreak could be stopped and the general public was not at high risk of infection, but it would be "extremely unwise" to let the virus circulate widely over a long period of time, Chan said. The agency said that if the meeting does reach that decision, it would “recommend appropriate temporary measures to reduce international spread.” The WHO statement did not elaborate on what those measures might be. The U.S. National Institutes of Health plans in mid-September to begin testing an experimental Ebola vaccine on people after seeing encouraging results in preclinical trials on monkeys, Dr. Anthony Fauci, director of the NIH's allergy and infectious diseases unit, said in an email. In its final stages, Ebola causes external and internal bleeding, vomiting and diarrhea. About 60 per cent of people infected in the current outbreak are dying from the illness. In Washington, meanwhile, U.S. President Barack Obama said “appropriate precautions” are also being taken ahead of the arrival in the U.S. capital next week of 50 leaders from Africa for a 3-day summit. "Folks who are from these countries that have even a marginal risk, or an infinitesimal risk of having been exposed in some fashion, we're making sure we're doing screening."